I am trying to remove an escalator from a Jennings Sun Chief mech. 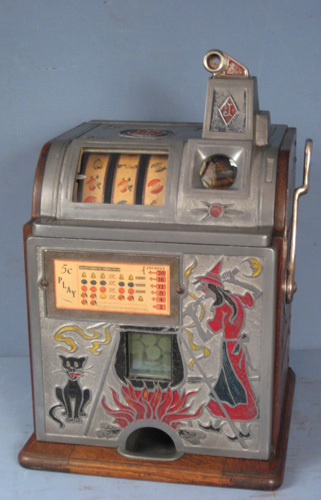 I have followed the steps in the "Owners Pictorial Guide: Jennings Bell Slot Machine by Geddes and Mead. I am up to the last step where it says "By gently prying the frame away from the two guide pins, the escalator can now be removed as shown in Figures 5.16 and 5.17 (page 23). My problem is that I cannot budge the escalator from the frame. There is absolutey no space to insert a screw driver or other tool. I have tried tapping a screw driver into the seam that separates the escalator from the frame, but it won't budge. Loosen the two screws that hold the side frames to the base plate. It will give you a little more freedom. Just loosen no need to remove them. You also have to loosen the bar that holds the side frames. It is just above the reel bundle in the back. Thanks. I see what you are referring to. I will give that a try. Man I dislike those Jennings escalators! I have tried the suggestions of loosening the side frames. I am still unable to separate the escalator from the left frame. I am sure it is not, but it is almost like it is welded together. Absolutely no loosening or movement at all. There is not even a tiny crack to allow insertion of a tool. Any further suggestions would be most welcome. Are you referring to the side opposite the coin tube? Is the reel bundle still on the mech? If it is you have to remove the cotter pin on the reel bundle rod. Soak the area with PB Blaster and let it sit for awhile then work a screwdriver in on the top side. The pins are mounted into the side frame I believe not the escalator. The pins will stay with the side frame. I will give that a try. I am referring to the side opposite the coin tube. Yes, the reel bundle is still on the mech. I did not know I had to remove that to remove the escalator.The Jennings book did not say anything about that. Can you please tell me what PB Blaster is? Just need to know what to ask for when I try to find it. PB Blaster is like a penetrating oil to free stuff up.